ignore m16 lower (that belongs to work, just needed something to hold a short upper since my two sbr'd lowers currently have short uppers on). 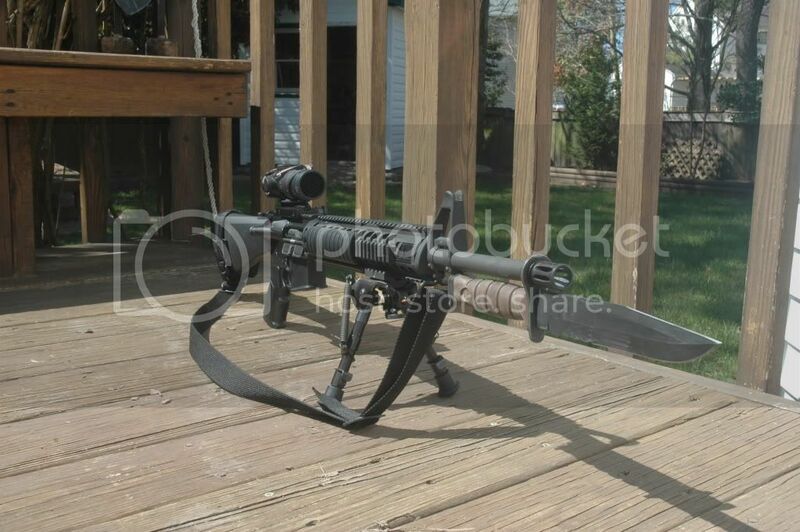 this was an old (new) 10.5" PSA CHF barrel collecting dust. Also collecting dust was the Midwest Industries rail and gas block. So I ordered a BCM blemished upper, replaced the forward assist (still working on it. 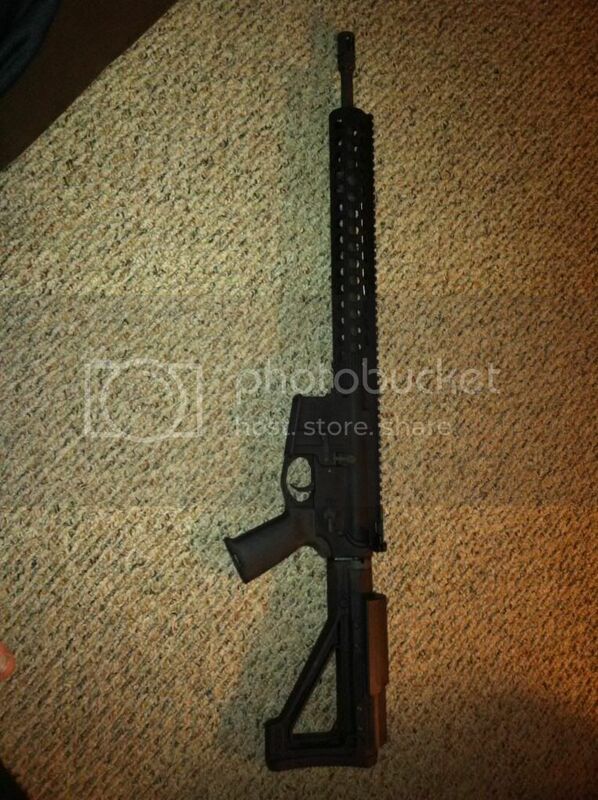 dangit) with a gas vent, a black YHM carbine gas tube and this is almost done. Need to redo the pin on the gas vent and slap some Troy flips on it. 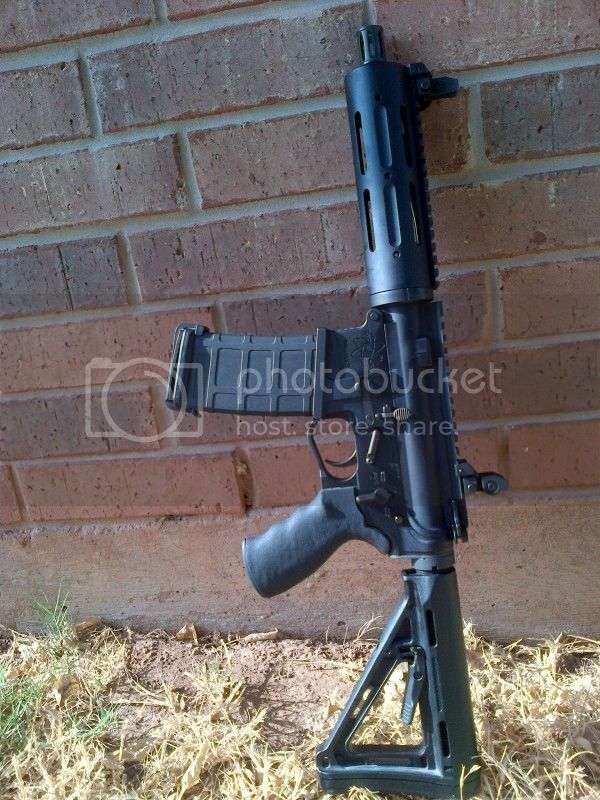 The AAC 51T flash hider/muzzle brake is temporary until I get my Specwar stuff in. ok, i stuck it on the lower it belongs to and put some troy flips on it. other than a red dot, this one is done. just waiting for a suppressor. 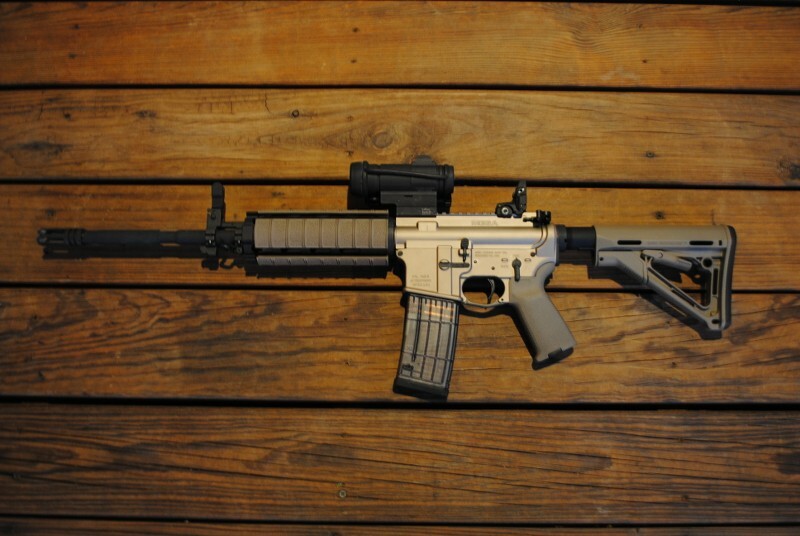 This is a (almost) 9" CMMG 22LR upper on a sbr'd PSA lower build. The original plan was to replace the 8.9" barrel with a 4.5" inch barrel so the suppressor will fit mostly under the rail. Decided not to do that. My first...B-Day present from my wife a couple years ago. Colt Sporter mutt thing. Still love this rifle. 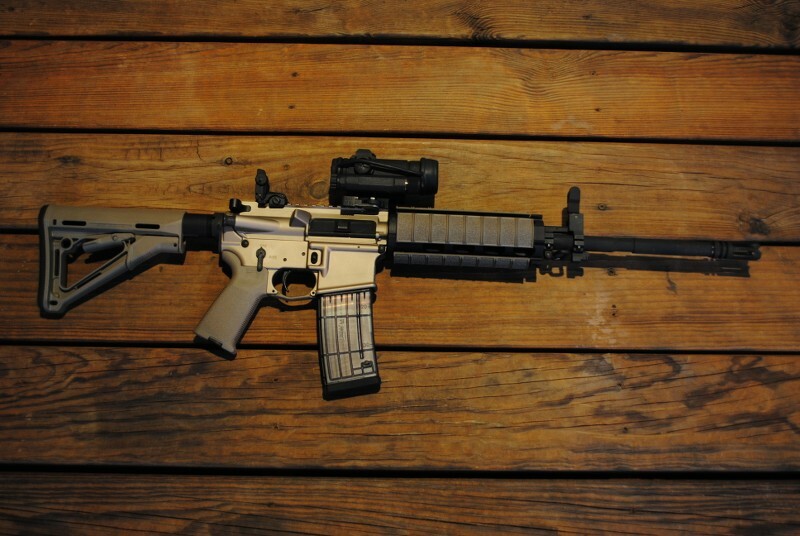 My wife's Noveske. 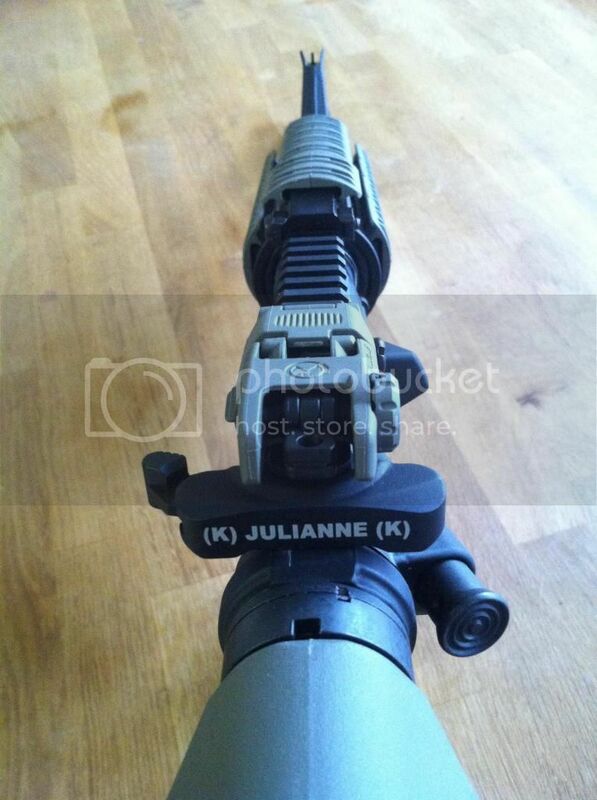 I bought it..she shot it...now she has a Noveske...Gotta love a woman that get bring the noise! And now for the newest baby in the safe, and by far my favorite gun that I own. 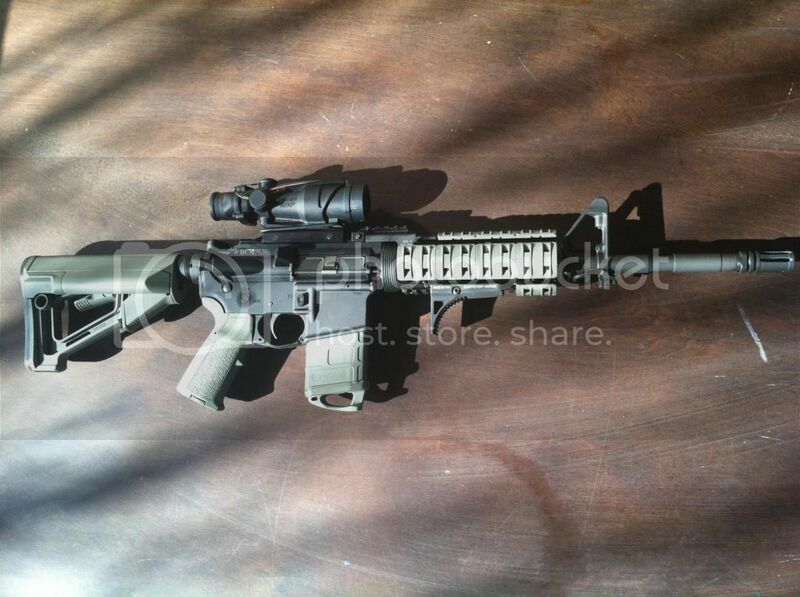 Knights armament SR 15 E3. Love. This. Gun. I present the Christmas Bonus AR Pistol. 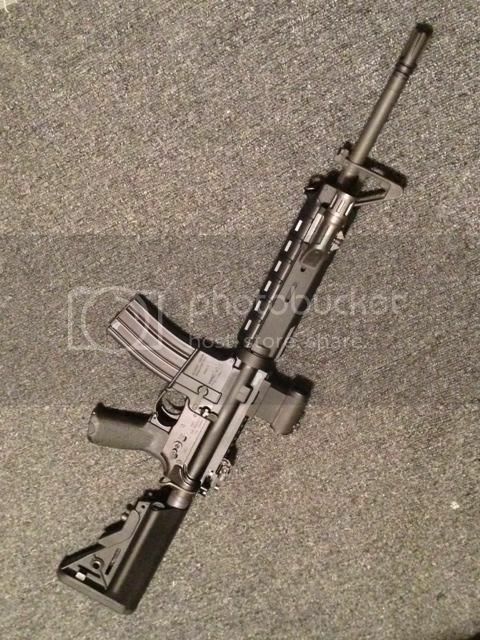 My BCM 14.5" SOCOM profile M4A1 clone. 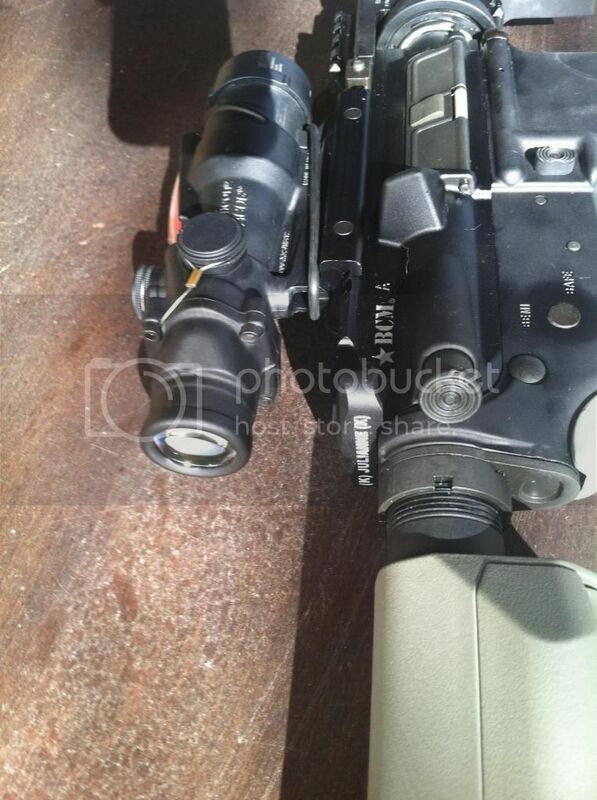 The ACOG is from my Bushy till I get an AimPoint PRO for the BCM. Lots of pretty AR's here, time to change that. Here's my first build. Still in progress. Still need to get off my duff and order the front sling swivel and a light. Haven't had time to "update" my AR. 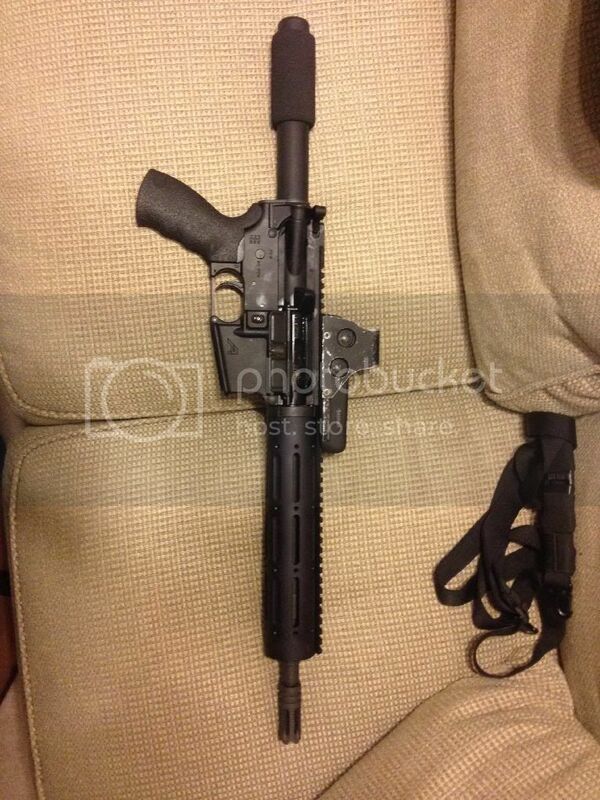 I'll prob just add the vortex FH, Magpul CTR, MOE grip, and MOE handguard. 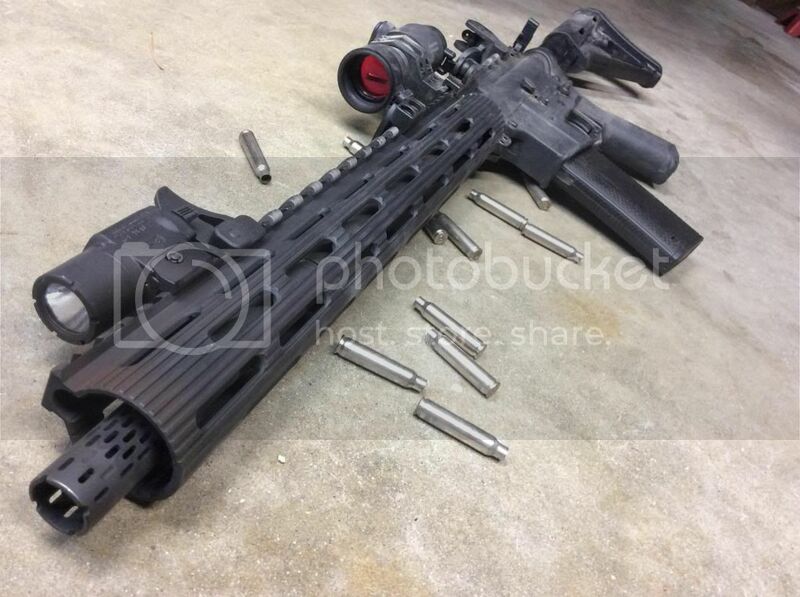 Do not mess up this rifle. 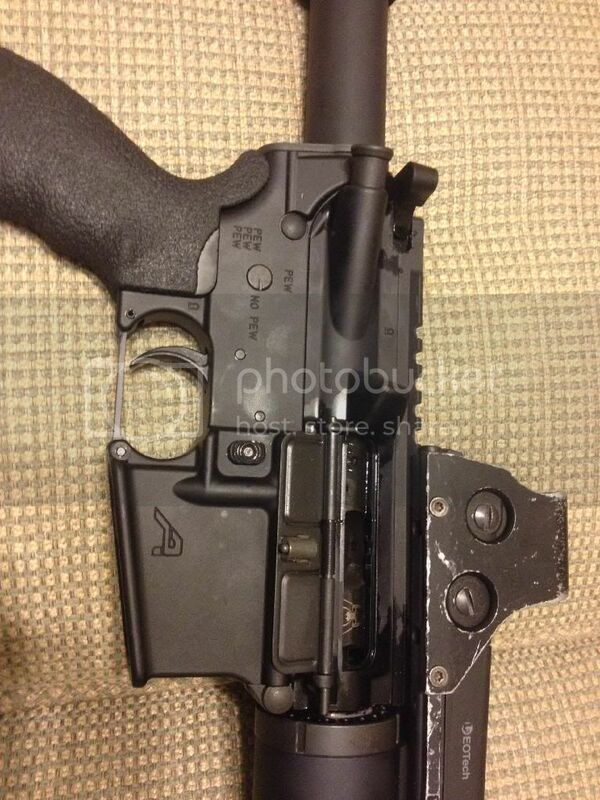 The CAR-15 is what the IDF was using in this configuration. With the collection of spare parts I had lying around (hence all the mix matched colors), the two spare M16s we had had stocks replaced (uppers are still in storage) and the uppers I ordered came in. 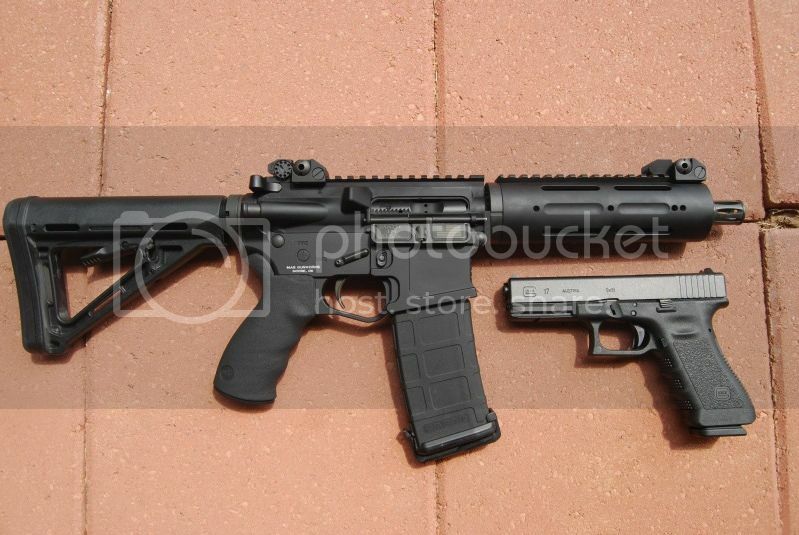 Both have LMT carry handles and one is a 10.5" LMT upper, the other is a 14.5" BCM upper. Will get these sighted in tonight and put in service tomorrow. 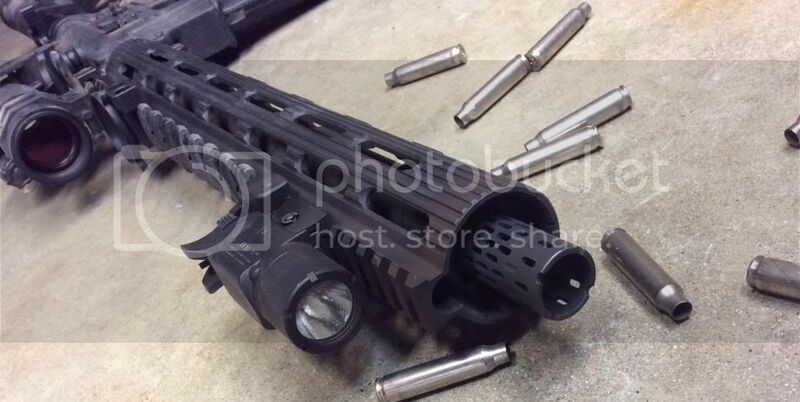 The 10.5 will eventually sport an AAC 51T muzzle brake to use with my AAC 762SDN6. My first AR build from a stripped lower/upper. Ya, I'll prob never get around to it anyways, since I've only had the vortex lying around since the turn of the century. My wife's Colt LE6520. It is such a sweetheart to shoot. Posted before, but here it is again. Love this thing. Best AR I have. My first post-AWB on the right. All LMT next to my M1A1 with repro stock. MT6700 with Colt Gov. profile 1/7 barrel. Also had SAW drill the lower for the captive take down pin. 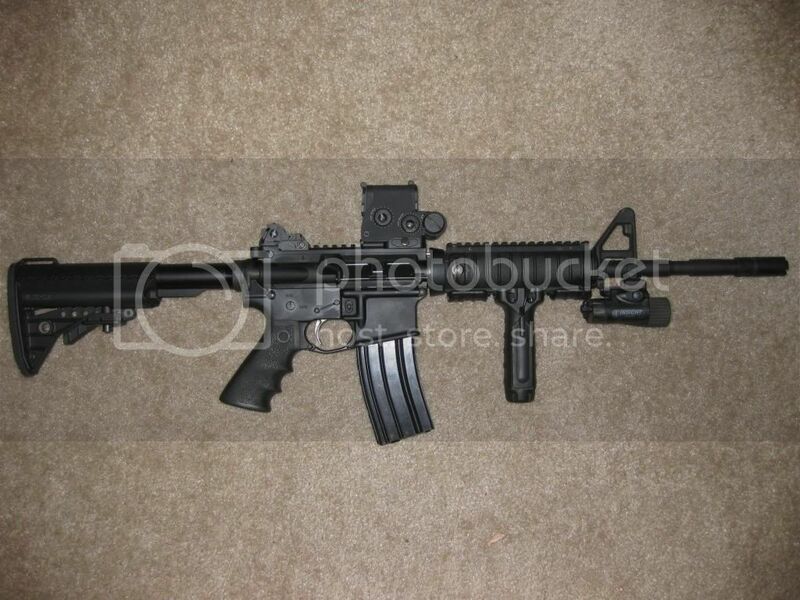 My M16A4 clonery..